By now you know the benefits of having both a diverse and inclusive workforce. You may even have some initiatives running and programming planned for your team. But did you know your hiring initiatives and recruitment processes could actually be undermining your efforts to improve D&I? We asked a panel of University and Corporate leaders to share how some recruiting tactics can work against diversity initiatives. For first generation college students, navigating the transition to college can be tough, with little context of what to expect, the need to balance family responsibilities, and challenges managing work and classes. One rough semester can make hitting the aspirational 3.5 GPA incredibly difficult. And GPAs don’t even predict a good hire. GPAs don’t measure grit. GPAs don’t measure successfully balancing life, work, and classes. GPAs don’t reflect the fresh start of finding a new major that is a better fit. Employers don’t want one-dimensional employees, so they should resist the drift into one-dimensional hiring. Some may argue that the campus recruiting practice of focusing on a handful of target schools can limit diversity. But I’ve seen that target schools can complement D&I initiatives if you really penetrate into the ecosystem of the university and penetrate the core of diversity at each school. To be effective, you need to make sure your targeted schools are capable of yielding a diverse pipeline in aggregate. I find we can often index 2x the representation of people of color at any given school by outworking the competition. Campus hiring is by far our best source of diversity, and part of what allows us to get more than our fair share on campus building a brand, which you can only do with sustained engagement and relationship building. I especially see technical roles creating more and more contests to test students’ skills, rewarding the winner with a job while leaving the losers high and dry. Essentially, these hiring challenges ask students to do a bunch of work for free with only one or two teams winning and getting the financial (and other) benefits. These contests are similar to an unpaid internship, which are often feasible only for students from affluent backgrounds. In fact, they’re even worse as a student may not want to include his or her participation on a losing project on a resume. I think having a thoughtful marketing campaign to attract diverse talent is important AND must be paired with real people, stories, and experiences at your company. Many of us have heard of the company or university that has that photo with ALL the brown people on campus in one photo and posts it on the website. I know the intent is to showcase that this is a place where an underrepresented person could come, but it's not authentic. As a black woman, I know there are very few places I can go and see many folks who look like me, so don't mislead me with the photo. Balance the photo with intentional effort on inclusion at the company or on campus and elevate those stories. If you have photos, have real efforts on campus, and your underrepresented folks share their stories authentically that will go so much further. Additionally, I appreciate when people are honest about not having it together around diversity, own where you're struggling and share what you've done to date. The authenticity of the challenge really resonates with most folks. I’ve never been a fan of GPA and standardized tests as being heavily weighted for admissions, and I think the same holds true for recruiting. You need to assess the full body of work to make a determination on someone’s “fit” for an organization or team. The further you move along in your career the less anybody cares about your GPA, so why is it so important for entry-level roles? If you want to create a diverse workforce, you need to look deeper and past the GPA as you are probably missing out on some diamonds in the rough. Some other things that people could look for are things like portfolios and experiences. These capture, to some extent, the full body of work. Portfolios shouldn’t be reserved for only some careers, rather they should become more widely accepted for all careers. There is a widening chasm between elite colleges and underrepresented-minority students who are qualified but ultimately do not apply to or enroll in such institutions. At the same time, HBCUs over the decades have moved from an access agenda to a completion agenda, and now to an agenda that focuses on students’ employability and connections to the workforce. In fact many, HBCUs are “going above and beyond what is expected of them” to prepare students for the modern day of work through high-impact practices including service-learning opportunities, learning communities, conducting research with faculty, an internship or field experience, study abroad, and a culminating experience like a senior capstone project. Want to hear more from these experts? 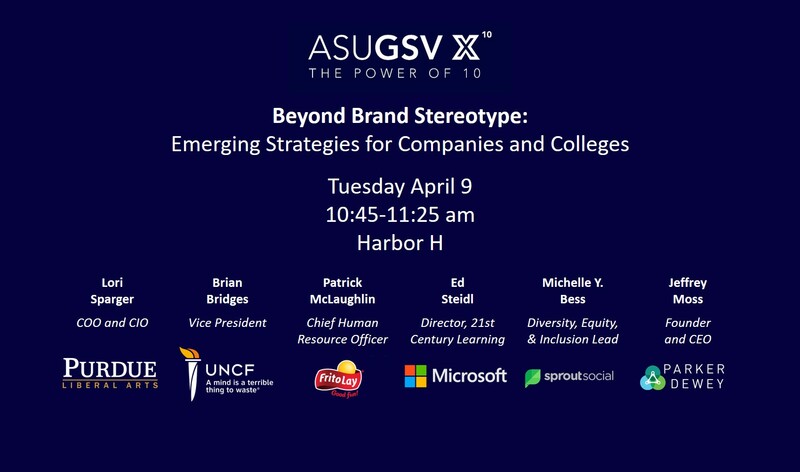 Join us at ASU GSV X for a panel discussion on Beyond Brand Stereotypes, on Tuesday, April 9.